We are proud to represent Itron as official suppliers in the UK, and for this month’s product spotlight we’re showcasing one of their best: the Itron CF Echo II ultrasonic flow meter. 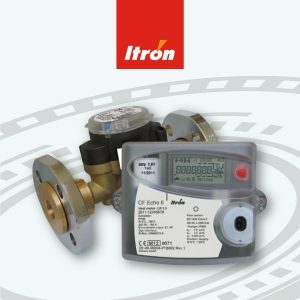 A part of Itron’s CF heating and cooling meter family, the CF Echo II is a smart metering solution that combines the functions of a heating and cooling meter, switching between the two as necessary to maintain the correct temperature. Not only is this convenient for the end user, it also means that installation and maintenance is much easier than with two separate units. The CF Echo provides a one-stop solution for your ultrasonic metering needs, with a compact design consisting of four key components: a brass bodied flow part, a split flange for easy installation, temperature probes, and a calculator for maintaining temperature and notifying of faults. This comprehensive package doesn’t come at the cost of dependability; the CF Echo II provides reliable and stable accuracy at high and low flows, measured from qp 0.6 to qp 15m3/h (DN15 to DN50). Highly precise electronic data processing allows accuracy throughout the entire measurement curve, producing a dynamic range exceeding class C.
The ability to deliver top performance in many environments is further augmented by the meter’s range of size options – from 15mm to 150mm – and compatibility with vertical or horizontal installations in flow and return pipes alike. These benefits make the CF Echo II an easy recommendation for residential and commercial applications alike. Don’t be fooled by the fact that the CF Echo II is simple and easy to install; it is fully capable of more complex functionality, should you require it. Capable of high-definition metrology, this meter allows advanced data-logging for complex network analysis, double tariff for further billing choices, peak recording and more. If you’re in a position where you need to keep track of usage and observe trends, the CF Echo includes vital diagnostic aids to make your job easier. With the included CF51 – a Class 2, MID approved calculation unit – this multitude of data is all available to read on a compact, multi-functional display, allowing you to diagnose faults at a glance. The meter is even compatible with M-BUS, Wireless M-Bus, Modbus and standard pulse output, as well as plug and play communication boards, allowing you to collect and observe readings remotely. These features make the CF Echo II an ideal companion for landlords and building managers, taking the pain out of meter reading and diagnostics. As well as the included 5-year warranty that you get when you order with MWA, we are exclusively able to provide the CF Echo II with 24v AC power supply modules. The CF Echo II is RHI compliant, meaning it is ideal for companies wishing to improve their energy efficiency and qualify for government incentives. Learn more about how we can evaluate and improve your energy efficiency with a site survey. MWA are proud suppliers of a wide variety of metering solutions, delivering in the UK within 24 hours when ordered before 4pm. Call 0121 327 7771 to learn more about how the Itron CF Echo II can suit your metering requirements or use our enquiry form below. You can also get in touch to ask us about specifying the right meter for any job.